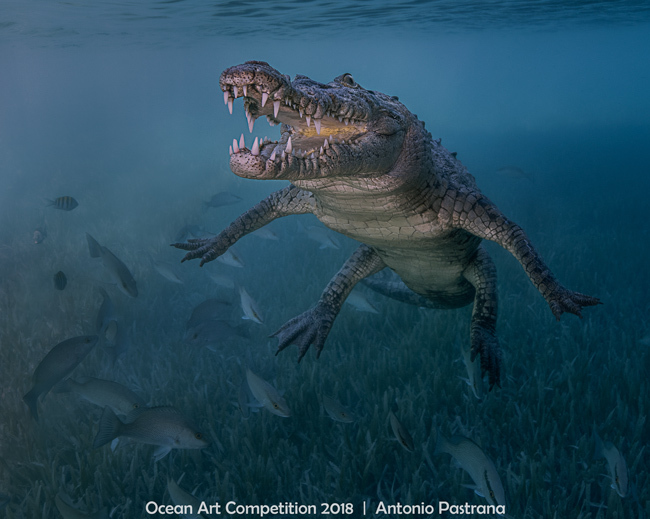 The Story: In my photo dreams I always had the idea of capturing a wild crocodile. But even when I have seen many in the wild, I have never been able to get in the water with one. That morning we saw this crocodile called El Niño. I was told he was nice enough to let you get close to him. He was watching us for quite some time and, when we decided to go in the water, I was nervous but excited. I approached him close to 10 feet when he started to move towards me, I got more nervous than before but he moved gently so I knew he wasn’t mad. He came towards me but dived underneath, so I turned around to follow him closely. When he turned around to face me, I had the opportunity to take this picture with a big smile. After getting the shot I edited in Lightroomma bit of exposure, less contrast, some highlights and less shadows and some clarity cropping the image on the right bottom side to get more close and giving the shot more balance. Equipment Used: Nikon D850, Ikelite Housing, Nikon 14-24mm Lens, Dual Jaunt 8,000 Video Lights.